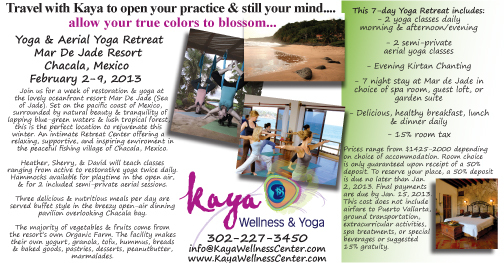 Join us for a week of restoration & yoga at the lovely oceanfront resort Mar De Jade (Sea of Jade). Set on the pacific coast of Mexico, surrounded by natural beauty & tranquility of lapping blue-green waters & lush tropical forest, this is the perfect location to rejuvenate this winter. An intimate Retreat Center offering a relaxing, supportive, and inspiring enviroment in the peaceful fishing village of Chacala, Mexico. 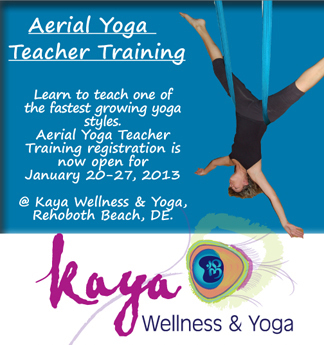 Heather, Sherry, & David will teach classes ranging from active to restorative yoga twice daily. Hammocks available for playtime in the open air, & for 2 included semi-private aerial sessions. Three delicious & nutritious meals per day are served buffet style in the breezy open-air dinning pavilion overlooking Chacala bay. The majority of vegetables & fruits come from the resort’s own Organic Farm. The facility makes their own yogurt, granola, tofu, hummus, breads & baked goods, pastries, desserts, peanutbutter, marmalades. Prices range from $1425-2000 depending on choice of accommodation. Room choice is only guaranteed upon receipt of a 50% deposit. To reserve your place, a 50% deposit is due no later than Jan. 2, 2013. Final payments are due by Jan. 15, 2013. This cost does not include airfare to Puerto Vallarta, ground transportation, extracurricular activities, spa treatments, or special beverages or suggested 15% gratuity. 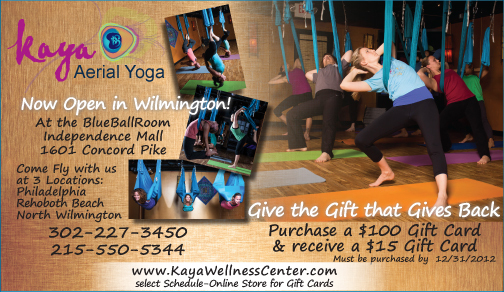 Enter Kaya to open your practice & still your mind…. Allow your true colors to blossom. Next Story → What Horses Do?